The 350th Air Refueling Squadron is a United States Air Force unit assigned to the 22nd Air Refueling Wing at McConnell Air Force Base, Kansas. It operates Boeing KC-135 Stratotanker aircraft conducting air refueling missions. A KC-135 Stratotanker from the 22nd Air Refueling Wing refuels a B-2 Stealth Bomber from the 509th Bomb Wing. To organize, train and equip to provide global mobility, 24 hours per day, 7 days per week. The squadron was originally established as one of the original Boeing B-17 Flying Fortress heavy bombardment squadrons of the 100th Bombardment Group in mid-1942 under Third Air Force, but was immediately transferred to Second Air Force for training. It remained a paper unit until the initial cadre of the ground echelon (4 officers and 27 enlisted men) were assigned at Gowen Field, Idaho. 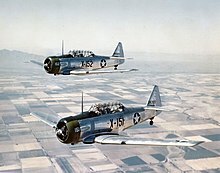 Two days later, the squadron departed for Walla Walla Army Air Base, Washington for Phase I training. There the first aircrew arrived on 1 December 1942. In February 1943, the ground echelon went to Kearney AAF, Nebraska, while the air echelon went to Ainsworth, Casper and Scottsbluff Army Air Fields, where they acted as instructors training other units for the next three months. On 28 April, Colonel Alkire, the first group commander was relieved of duty. Two days later, the air echelon returned to Wendover Field, and would not be reunited with the ground echelon until arriving in England in June. The ground echelon proceeded by rail to Camp Kilmer, then embarked on the RMS Queen Elizabeth, sailing on 27 May and arriving at Greenock on the Firth of Clyde, where they disembarked on 3 June. The flight echelon ferried their aircraft through Maine, Newfoundland, Labrador and Iceland to the United Kingdom. The 350th engaged in strategic bombardment operations over Occupied Europe and Germany, sustaining very heavy losses of personnel and aircraft while conducting many unescorted missions over enemy territory attacking airfields, industries, naval facilities and transportation hubs. The squadron flew its first mission against Bremen, Germany on 25 June 1943. During the summer of 1944, aircrews bombed enemy positions at Saint-Lô, followed by similar campaigns at Brest in August and September. In October 1944, the squadron attacked enemy and ground defenses in the allied drive on the Siegfried Line, then bombed marshaling yards, German occupied villages, and communication targets in the Ardennes during the Battle of the Bulge from December 1944 to January 1945. Attacked enemy targets in Germany during the spring of 1945, ending combat operations a strike on Berlin on 20 April 1945. The squadron remained in Europe as part of the United States Air Forces in Europe occupation forces, dropping food to the people in the west of the Netherlands, and in June transported French Allied former prisoners of war from Austria to France. Demobilizing in England, in December 1945 the squadron inactivated as a paper unit. The 350th activated in the Air Force Reserve in 1947 at Columbia AAB, South Carolina. It is unclear whether or not the unit was manned or equipped. It was inactivated in 1949 when Continental Air Command reorganized its reserve organization according to the Wing Base Organization. The squadron reactivated under Strategic Air Command in 1956, and received new, swept wing Boeing B-47 Stratojet, which was designed to carry nuclear weapons and to penetrate Soviet air defenses with its high operational ceiling and near supersonic speed. The squadron flew the B-47 for about a decade when by the mid-1960s it had become obsolete and vulnerable to new Soviet air defenses. 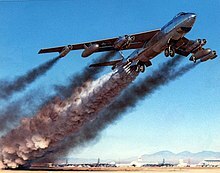 The squadron began to send its Stratojets to The Military Aircraft Storage and Disposition Center at Davis-Monthan AFB for retirement in 1965, the last being retired in 1966; it was one of the last B-47 squadrons. It was redesignated as a strategic reconnaissance squadron, operating Ryan AQM-34 Firebee strategic reconnaissance drones launched from DC-130 Hercules aircraft and recovered by Sikorsky CH-3 helicopters from 1966–1976. 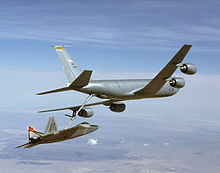 Transitioning to the KC-135Q Stratotanker in 1982, the squadron provided refueling support for SR-71 aircraft from, 1983–1990. The 350th also provided cargo support and intratheater refueling during combat in Southwest Asia from August 1990–March 1991 during the Gulf War. At the end of the Cold War, the Air Force underwent extensive changes as a result of several rounds of Base Realignment and Closure (BRAC). On January 1, 1994, the 22nd Air Refueling Wing was assigned to McConnell Air Force Base, Kansas, as part of the Air Force's plan to return McConnell AFB to an air refueling hub. The 384th Air Refueling Squadron, a geographically separated unit of the 19th Air Refueling Wing (at Robins Air Force Base, Georgia) and a McConnell tenant unit, joined the 22 ARW as the first of four Boeing KC-135 Stratotanker squadrons to comprise the wing’s new tanker force. Within eight months, the 350th, 344th, and 349th Air Refueling Squadrons joined the 384th in the 22nd Operations Group to fly the wing's 48 KC-135s. In 1997, the Republic of Singapore Air Force (RSAF) selected McConnell as its training base for its KC-135 crews and maintenance personnel. The RSAF stationed two of their Stratotankers with the 22 ARW, naming the organization the Peace Guardian Detachment. From 1998 to 2003, the RSAF maintained a 300-person detachment at McConnell and trained with the 350th on air refueling techniques, tactics, and general airmanship. After the September 11, 2001 terrorist attacks against the United States, the Pentagon launched the Global War On Terrorism (GWOT). The 22nd Air Refueling Wing at McConnell AFB initially deployed tanker crews in support of Operation Noble Eagle (ONE). Before the end of the year, McConnell tankers were sent to the Middle East, Central Asia, Horn of Africa, and other locations to provide aerial refueling support during Operation Enduring Freedom. Beginning in 2003, the 22nd ARW took an active role in Operation Iraqi Freedom as tanker crews deployed to the Arabian Peninsula. ^ a b c Robertson, Patsy (19 June 2017). "Factsheet 350 Air Refueling Squadron (AMC)". Air Force Historical Research Agency. Retrieved 24 July 2017. ^ Larsen, Steve A. (2008). McConnell Air Force Base (Images of Aviation: Kansas). United States: Arcadia Publishing. p. 110. ISBN 978-0-7385-6183-7. Sheridan, Jack W. (1946). They Never Had It So Good: The Personal, Unofficial Story of the 350th Bombardment Squadron (H), 100th Bombardment Group (H), USAAF 1942-1945. San Francisco, CA: Stark-Rath Printing Co. Retrieved 7 September 2013.